Objective: To determine the role of hypertension, hyperlipidemia, smoking and positive family history of diabetes and hypertension in the development of diabetic retinopathy. 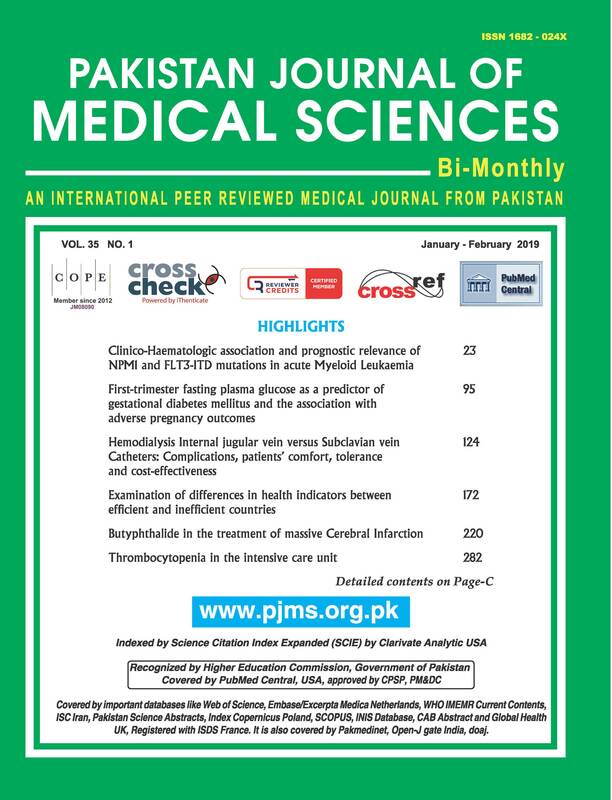 Methods: This prospective cohort study was conducted at the Department of Chemical Pathology, Armed Forces Institute of Pathology, Rawalpindi over 2 years period from June 2014 to June 2016. One hundred consecutive diabetic patients with no signs of diabetic retinopathy and good glycemic control (HbA1c<6.5%) were registered by non-probability convenient sampling after taking written informed consent. They were evaluated for hypertension, hyperlipidemia and smoking status. These patients were then followed 6 monthly for 2 years to look for the development of diabetic retinopathy. Results: The mean age of the patients was 50.72±9.29 years and there were 57 (57%) male and 43 (43%) female patients. Majority (82%) of the patients had NIDDM. The mean duration of diabetes was 8.31±6.83 years. 11% of the patients were smoker, 37% were hypertensive, 6% had hyperlipidaemia, 62% had family history of diabetes and 30% had family history of hypertension. At the end of follow-up, 9 (9.0%) patients had diabetic retinopathy. The frequency of diabetic retinopathy increased with increasing age of the patient; however, the difference was statistically insignificant. A comparatively higher frequency of diabetic retinopathy was also seen in patients with IDDM and those with positive family history of diabetes and hypertension yet again, the difference was statistically insignificant. Also, no significant difference was noted among male and female genders and smokers vs. non-smoker. However, the frequency of diabetic retinopathy increased significantly with increasing duration of diabetes. It was also higher among those with hypertension and hyperlipidemia. Conclusion: Higher patient age (≥50 years), increasing duration of diabetes (≥20 years), insulin dependent diabetes mellitus, hypertension, hyperlipidemia, and positive family history of diabetes and hypertension were found to be associated with increased frequency of diabetic retinopathy.